This week we have some exciting new tools, a robot platform, and some other stuff. I don't want the video in any way to take away from the Rover 5. It's a GREAT robotics platform, but we seriously beat it to death. I'm surprised it took as much abuse as it did - there's a lot we didn't show because the camera wasn't rolling. Also, the power cord was recessed and I couldn't see it very well. Sometimes you just need a basic robot platform to start prototyping your next project. The Magician Chassis is exactly that. The kit consists of two pre-cut pieces of plastic, hardware, motors and wheels. 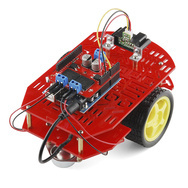 By adding an Arduino and a motor driver, you can easily get a robot up and running. This is a great kit for beginners and educational purposes. If you've ever tried to do any SMD soldering without a hot-air rework station, you can find it quite frustrating. Once you use hot-air for SMD work, you may never go back! We have a new SparkFun-branded hot-air rework station that should work well for just about any application. I actually used one of these just last week to reflow the BGA video IC on my laptop. Once you work with hot-air, you feel like you can rework any board. This rework station features adjustable temperature and airflow as well as a digital temperature readout. It also includes two nozzles. We have a new version of our SparkFun-branded soldering iron. This new version has some slight cosmetic changes, but is overall just as good as the old one. It includes the a nice base and a soldering iron complete with SparkFun flame. 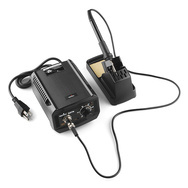 This 50W iron is adjustable (with an analog dial) and is ESD safe. Also, I'd like to point out that we still have some of the old one left, and they are currently on sale for $29.95 until we run out! Get them while they last. An oscilloscope is something you will probably end up needing if you spend enough time with electronics. 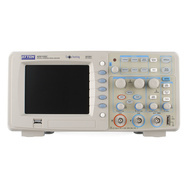 Our new 100MHz Digital Oscilloscope is pretty handy if you need to measure and view waveforms. You can even control the unit over USB and save waveforms to a USB flash drive. It even has a full color LCD screen and comes with probes. What else could you ask for? Actually, don't answer that. You asked for it. 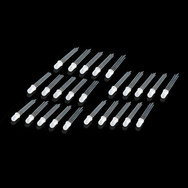 Everyone's been asking for not only common cathode RGB LEDs, but common anode as well. And with a face like that, how could we resist!? Now we have common anode RGB LEDs in singles that are diffused and clear. We also have 25 packs of diffused and clear. 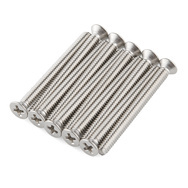 In an attempt to start carrying all of our hardware in packs of ten, we now have our 1.25" 4-40 screws in packs of ten. They are metal. They are screws. That's about all there is to say about them. There it is, your new products for this week. I really encourage everyone to check out the new tools. We'll see you again next week with a new video, post, and more products. See you then. Maker Faire Time Lapse and Flickr Photos! Seriously greatest new product line-up in some time! It's definitely in the top ten, but I'd have to say this was the best product line-up ever. That BGA GPU you reflowed on your laptop wouldnt have been for a ThinkPad, would it have been? Yeah, when you said "improper design and poor heat management", I immediately thought "must be Dell". 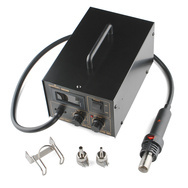 Great price for the hot-air rework station and soldering station. It's a shame they're not dual 115v/240v switchable. Even with the freight charge to New Zealand, these are a bargain. I'm sure you'd up your international sales if some thought was given to this 115v/240v issue. Aw dang. I just got a DSO Nano v2 and that new one not only has 1 more channel, it also looks easier to use. I second having the cool-man bust through the walls -- eh, can it wait until after the open house? I'd like to see the wall in person; is the "studio" on the tour? And that's how you know Sparkfun's marketing works. Wow, that magician platform looks really great. Too bad I just ordered some stuff last week. It's a really good price :). not without buying the new one and having a backup. but don't worry, it's just a cosmetic change, that's all. I assume you mean 4-40 not 2-40 screws. And since I'm curious, what did you do with the video chip from your laptop once you removed it? I didn't do anything, it just needed to be reflowed. improper design and poor heat management (and apparently poor reflowing to begin with) resulted in the video not working at all. it just needed to be reheated (kinda like re-seating an IC in a DIP socket) and it worked again. It was a known issue, thankfully, and my chip hadn't fried. Rob way to slap the stuff off your desk! Oh, and RTFM on the O-Scope Power Cable!lol. haha, yeah. that thing is recessed in like 4 inches and in a shadow, etc, etc, etc. How about a link to the new soldering iron?